Yes! We CAN Come To You! IS YOUR SKY GOING TO BE CLOUDY TONIGHT OR TOMORROW NIGHT? This 48-hr weather forecast is made for astronomers by astronomer Attilla Danko. We rely on it because it's ALMOST never wrong. If you're not sure how to read this, click on chart for detailed instructions. more darker blue squares you see... the better! If during the 3-hr course of a Telescope Tour, the sky never gets better than 30% clear (NWS definition of "Mostly Cloudy") for at least 30 minutes, we offer 79% REFUNDS. When we are sure it will be too cloudy, we will call/text and email to cancel. Otherwise, when it is too close to call, you are still obligated to attend so as to earn your refund. We'll still offer the multimedia show while we wait for sky to clear. So at worst, you get a fun show with a 79% refund. At best the sky will clear, and all will rejoice. If additionally, you purchase Cloudy Weather Insurance and fulfill the alternative night(s) booking agreement (see below), you will get 100% refund of your tour tickets, when the sky remains more than 30% cloudy on your intended AND your booked alternate night(s). Folks like to brag about their rapidly changing weather. In reality few places rival the clearing speed of the Colorado Plateau. The time-lapse above goes from 100% overcast, with lightning, to 100% clear in 90 minutes! Plan for a 2nd or 3rd alternate night! Many tell us they plan their entire vacations around stargazing with us the Dark Rangers. So if what we offer is also that important to you, book lodging for more than one night in the Bryce Canyon region, AND book your alternate night tickets for $1 each that we call "Cloudy Weather Insurance." By booking 1 or more alternate nights at the Dark Ranger Observatory, you increase your chances of seeing our breathtaking night sky undiminished by clouds. Though we routinely try to reschedule all guests to avoid cloudy nights, purchasing these tickets gives you top priority as we try to move guests from a cloudy night to a more likely to be clear night. NOTE: Alternate night means you are booking a DIFFERENT night than your primary night. Insurance is nonrefundable. Sorry, $1 barely covers booking and credit card fees, to say nothing of managing 2 guest lists every night. Additional Benefit: If in the rare event clouds prevent the use of telescopes on both your intended night and 1 or more alternate nights, you will get a 100% refund. In this way, the $1 per ticket cost provides you with insurance against cloudy weather. Guests who do not purchase alternate night ticket(s) are ONLY entitled to a 79% refund when the sky is more than 70% cloudy on their intended night. 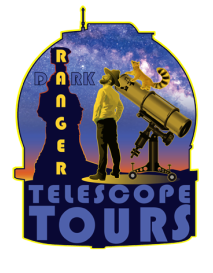 NOTE this $1 per person ticket is only valid with the purchase of an equal number of telescope tour tickets for a primary (your intended) telescope tour night. Disclaimer... (That you will later wish that you had read and not skimmed). Purchasing alternate tickets does NOT guarantee successful stargazing, it just increase your chances of success. It's possible your primary intended night and your 1 or more alternate nights, might all be too cloudy. Other times your alternative night might fill up with regular bookings. Since we cap our attendance at 42 guests, and because primary night booking take precedence, alternate night tickets will be cancelled (without refund -- see above) in the reverse order in which they were purchased (similar to the policy of "last hired = first fired"). Pay attention to your email so that you will realize if and when your alternate night has been cancelled thus alerting you well enough in advance that you can exercise the option of re-booking another alternate night -- assuming your vacation schedule allows. You haven't booked a telescope tour yet? Maybe our TripAdvisor reviews will convince you?